1. Who is the REAL Black Hood on Riverdale? He was present at the Jubilee, knew of Polly’s whereabouts, had Betty’s phone number and info about her childhood, knew about Grundy’s ‘sin’, knew about Alice’s past and knew that the Sugarman existed. The victims so far include: Fred Andrews (shot but survived). Miss Grundy (strangled and killed). Moose (shot), Midge (shot but survived, stabbed to death on second attempt), and the Robert Phillips, the Sugarman (shot and killed). Hal looks VERY similar to the BH and is suspiciously never around when things happen but we have no idea about his possible motive. 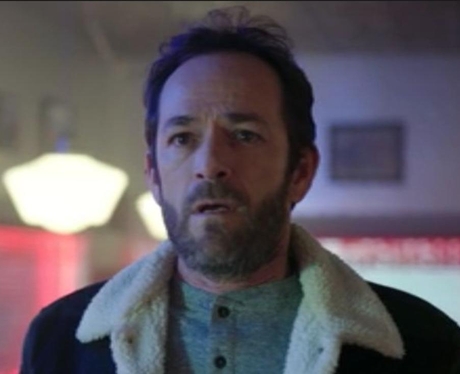 He is someone who would know everything the Black Hood knows, especially all the facts about Betty, Polly and Alice (he also has access to the Riverdale Register archives.) But if Hal *is* the killer, then his affair with Penelope while he was still married to Alice surely broke his own moral “rules”? And why would he have shot Fred anyway?! Hiram has been a main suspect from day one. We know he plans to take over the entire town and he could be doing it by terrorising everyone into thinking they need his protection. It’s clear that it’s not Hiram behind the mask but what if he hired someone to do his bidding? He once employed Tall Boy - who has very similar eyes to the BH - to carry out some light vandalism. Hiram could also be the one calling Betty. He’s also the only person with a motive to shoot Fred and get rid of the Sugarman. If we were you, we would keep a very close eye on Tall Boy. His eyes, eyebrows and the wrinkles on his face are almost identical to the Black Hood’s and he always wears an outfit very similar to the man who shot Fred. But what’s his motive? As we said, he could have just been hired as a hit man. A serpent looking to make money, who doesn’t mind a murder or too? Tall Boy is your guy. At the start of the season, Sheriff Keller was acting HELLA suspicious. He didn’t want to cooperate with Archie regarding Fred’s shooting, he was always AWOL, he literally has no clue. The Sugarman was also shot INSIDE his cell in jail and Keller would be the only one with access to entry. More recently, how and why did he not manage to notice a MURDER backstage during the musical when he was meant to be acting as security?! If he’s not the Black Hood, then he’s probably helping who ever is. The Black Hood is clearly not a teenage girl but Ethel's behaviour and her attitude toward the morally corrupt people of the town could have a much more sinister undertone. In 2x16, when Ethel threw the milkshake on Veronica, she said "For your crimes against the town of Riverdale, for everything you and your family have done and continue to do, we find you guilty..." Sounds like something the Black Hood would say, and also... who is "we?!" Then there was the magazine cuttings in 2x18 too.